Remedy Entertainment, the Finnish developer behind Max Payne and Alan Wake, has filed a trademark for a new thought-provoking, character-driven gaming experience: Death Rally. 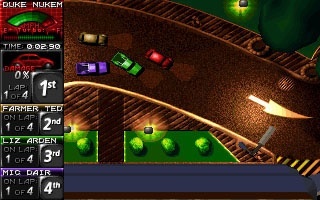 The preceding statement may not have been entirely true: I don't think it's very likely that Death Rally will be either thought-provoking or character-driven and it's certainly not new: Death Rally was actually Remedy's very first game, originally released in 1996 under the Apogee banner. The only truth to be found anywhere in that sentence, in fact, is that the studio has filed a trademark for a new version of the game. The USPTO filing doesn't say much: The trademark is for "computer game software, and any printed instructions or printed hint manuals sold therewith as a unit." Fortunately, Remedy's Oskari HÃ¤kkinen was willing to shed a little more light on the matter. "There are quite a few fans of Death Rally out there and over the years Remedy has been hit by various requests time and again to do something around it," he said. "With Death Rally we're looking at getting something neat out to the community by having a version that is playable on modern PCs out there." "This is more of a sweet small thing for people, rather than a full scale commercial project at this point," he continued. "We've really enjoyed playing some of the classic games that we have grown up with, and having the opportunity to revisit Death Rally and to share those memories with the fans and community would simply just be cool." A launch date and other details haven't been settled, he added. It may be a "small thing" but as a fan of guns, cars and Remedy, I don't see how any combination of the three could possibly add up to anything less than a fuel injected suicide machine of awesome.